Schultz, in a "60 Minutes" interview aired Sunday night, said that Trump was "not qualified to be the president" but also blamed both Democrats and Republicans for "consistently not doing what's necessary on behalf of the American people." Former Starbucks chairman and CEO Howard Schultz is taking steps to mount an independent campaign for president, he announced Sunday. Schultz plans to travel the country over the next several weeks as part of a book tour before deciding whether to formally enter the race. His book, “From the Ground UP: a Journey to Reimagine the Promise of America,” will be released Monday. He is the second person from Washington state considering a run for president. Gov. Jay Inslee has said he will decide “within weeks” whether to seek the Democratic nomination with a campaign focused on battling climate change. Word of Schultz running as an independent has been met with hostility by leaders of both major political parties. Democrats sounded especially alarmed at what they view as a possible spoiler candidacy. In a statement Sunday, Tina Podlodowski, chair of the Washington state Democratic Party, slammed Schultz’s ambitions as selfish. “Howard Schultz running as an independent isn’t about bringing people together. It’s about one person: Howard Schultz.” she said. Podlodowski said Schultz, who has identified himself as a lifelong Democrat, has never met with her and ignored recent invitations to discuss his political plans over coffee. Washington State Republican Party Chairman Caleb Heimlich predicted Schultz, 65, would not find much support in his home state, citing Schultz’s sale of the Seattle Sonics basketball team in 2006. Schultz and his ownership group, The Basketball Club of Seattle, sold the team after complaining about a refusal by state and local lawmakers to spend public money to expand KeyArena. The team was purchased by a group of Oklahoma City businessmen, who moved the team there in 2008, ending a 41-year run in Seattle. Still, Heimlich argued Schultz might find traction with disaffected moderate Democrats in 2020 if the party nominates an extremely liberal candidate for president. Schultz got a more positive reception from groups that have tried — and mostly failed — to get independent candidates elected to office in recent years. Even if unsuccessful, he said, a robust independent candidate could work to ease ballot-access restrictions for future third-party contenders. Such laws vary by state. Washington’s relatively easy rules require independent or minor-party presidential candidates to hold nominating conventions and obtain signatures from at least 1,000 registered voters. Troiano said any independent candidate should remain in the 2020 race only if they have a path to victory. 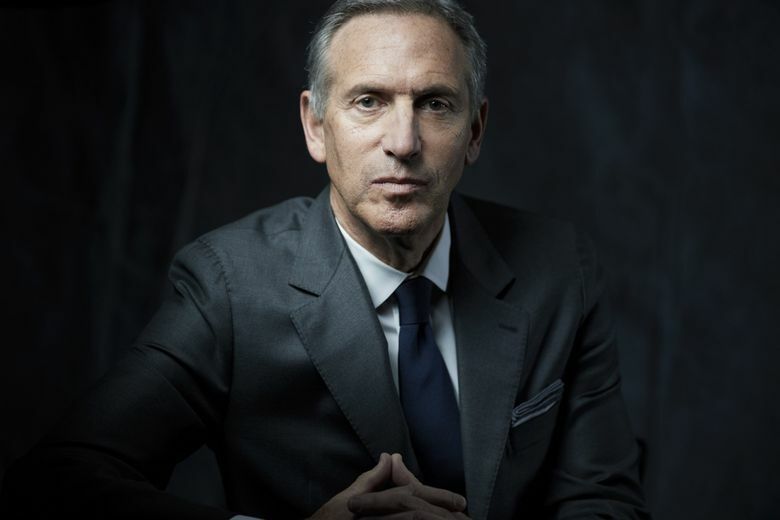 In two stints as CEO of Starbucks, Schultz turned a small Seattle company that sold whole coffee beans and coffee machines into a global behemoth — a coffee, tech and lifestyle company with more than 15,000 company-owned stores and 291,000 employees, bringing cafe culture to the masses. He fashioned Starbucks as a company with a social conscience, offering health insurance to both full and part-time employees back in 1988, when such practices were virtually unheard of in big corporations. In The Seattle Times interview, as in his new book, Schultz spoke at length about how his own humble roots growing up poor in New York have influenced him. “I have lived the American dream. I am self made. I grew up in public housing,” he said. “I have a deep, deep sense of compassion” for the nearly half of Americans who don’t have $400 in the bank for an emergency. In 2014, Starbucks launched a program offering fully reimbursed college tuition to employees who take online classes at Arizona State University. Schultz has led high-profile efforts to hire both 10,000 military veterans and 10,000 refugees at Starbucks stores. Last year, under pressure from environmentalists, the company vowed to stop using plastic straws and launched a $10 million effort to redesign its cups for easier recycling. But he’s also run the company with an eye on the bottom line. When Schultz took back the reins at Starbucks in 2008, after an eight-year hiatus, the company was still growing and profitable, but had seen profits tumble as the economy nose-dived. Schultz ultimately closed 900 stores, laying off tens of thousands of employees and drastically slashing expenses. Last year, just before his retirement as chairman of the Starbucks board, Starbucks pledged $25,000 toward a campaign to repeal Seattle’s head tax, a tax on big businesses to raise money for low income housing and homeless services. And his leadership of the company has made him fabulously wealthy. He owns nearly $3 billion of Starbucks stock and received about $20 million a year in compensation in his last years at the company. He also had an arrangement with the company in which Starbucks paid him about $270,000 a month to lease a private jet that he controlled. Starbucks’ business interests could present conflicts if he were elected. The company has more than 3,500 stores in China, its fastest growing market, and Schultz remains its largest individual shareholder. Schultz’s specific policy views are not well known, but he has expressed concern with the $22 trillion national debt, both in terms of federal spending and the tax-cut bill passed by Republicans last year. In the Sunday interview, Schultz said “both Democrats and Republicans are complicit in their recklessness” on the debt, putting future generations on the hook. Asked how he’d cut the debt, Schultz did not mention tax increases or spending cuts, but talked about stronger economic growth fueled by comprehensive immigration reform. Despite his criticisms of both parties, Schultz said the dysfunction in them is not equal. For example, he laid blame for the recent federal shutdown squarely on Trump. “First and foremost, the president of the United States is solely responsible for shutting down the government. His lack of moral leadership is evidence to me he is not qualified to be president and needs to be removed from office,” Schultz said. Over the years, Schultz has directed most of his relatively modest political giving toward Democrats. But his most recent political donation, his largest ever, foreshadowed an independent turn. Schultz gave $50,000 last March to a super PAC that works to elect veterans to public office. The PAC, With Honor, helped a roughly equal number of Democrats and Republicans in U.S. House races last year. Amazon’s Jeff Bezos donated $10 million to the same group last year. Schultz previously gave nearly $11,000 to the Democratic National Committee in 2016, while not directly donating to any presidential candidate. He’s consistently donated to Washington’s Democratic senators, Patty Murray and Maria Cantwell. In 2008, he donated to all three major Democratic candidates in the presidential primary — Barack Obama, Hillary Clinton and John Edwards — and then donated to Obama in the general election against John McCain. But Schultz donated to McCain in 1999, as the Republican senator was preparing a presidential run. Later that election cycle, after McCain’s defeat, he gave $50,000 to the DNC. He also has donated to a few local candidates, including $500 to Seattle Mayor Jenny Durkan’s 2017 campaign. Party officials like Podlodowski weren’t the only ones expressing unease about an independent run by Schultz. Will Stiles was one of the first store managers at Starbucks, back in 1982, before becoming a product manager and moving to the corporate offices, working for Schultz for nearly 20 years. Still, Stiles has concerns about a presidential campaign. He’d prefer almost any of the prominent Democrats pondering a run, and referenced the spoiler role that third party candidate Ralph Nader played in the razor-close 2000 election.